My husband and I enjoyed a night with my co-workers for my company’s annual holiday party. It was fun! They had casino night set up, raffle, etc. I won a bottle of ONEHOPE 2009 Sauvignon Blanc. I had it before so I wasn’t disappointed in my win! Afterward, we went out with my work “brother” (we all have that co-worker who we affectionately refer to as a family member) and his fiancée. They live in Orange County so since they were out-of-town folk, we took them to Extraordinary Desserts in Little Italy, San Diego. My husband and I both said that the next time we go we are going to get the hot fudge sundae. And we did! The menu describes it as: Very Vanilla Bean ice cream, brownie chunks with nuts, warm housemade chocolate ganache, and whipped cream. It is SO good! And more than enough for two people. I also had my favorite tea: Rooibos Bourbon. I can’t find the tea for sale on the Extraordinary Desserts online store but this is probably the same or very similar. It is such a smooth, luxurious tea! Love it! If you live in San Diego, Extraordinary Desserts is a great place to go and if you have friends in town, take them here! September marked a lovely cooking experience! 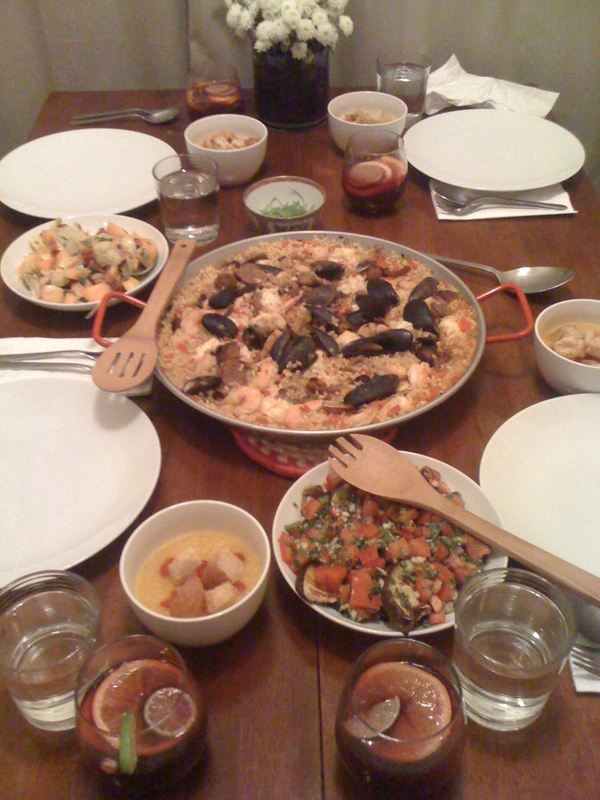 It was our month to make dinner and we chose Spain as the country from which we made recipes. These are the recipes we used, and of them, the Patatas Bravas and Berenjena con Vinagreta (eggplant topped with tomato vinaigrette) were our favorites. Each month had to have theme beginning with the first letter of the month corresponding to a country, e.g. Jamaican January. The couple who is hosting must do all the cooking from scratch. December – because the holidays are so busy, we took this month off.